LETTER | Recently the government announced two initiatives that focus on the 'golden child', i.e., the bottom 40 percent (B40) income group. These are the Peka B40, which focuses on health screening for a target group of about 800,000 people, and MySalam, programme that covers 36 critical illnesses, that focuses on about four million members of the B40 segment. MySalam uses a standard Malaysian insurance industry definition. The two programmes appear to give a primary focus on political mileage rather than public healthcare. The public healthcare is the secondary objective, and it seems money is no object in achieving political ends. This is shocking to read for a government that has declared they are very concerned that the country has a huge debt of RM1 trillion. The Health Ministry has the assets and people to reach any B40 group in the country. Simple logic will confirm that if the ministry cannot reach them, no private GPs will open a clinic in such a remote area. So why isn't Peka B40 leveraging on the government machinery and network? After all, the ministry has all the data of the B40, and it can do all the tests at 40 percent of the cost that is being offered to private doctors. The programme budget of RM100 million can be better utilised within the public healthcare network. Protect Health can easily manage the administration of the services using the Health Ministry infrastructure. After all, the ministry has been doing health screening for free at its hospitals, and ultimately it has a proven track record and is responsible for managing public healthcare services. What is needed is re-branding, promotion, and improving the existing programme to achieve the necessary political mileage and ensure as many from the target group are met. There is no value in enriching private labs and GPs. Part of the funds can be used to enhance the efficiency of services that will eventually benefit all visitors to public health facilities. The MySalam, as I understand it, is leveraged on the RM2 billion donation received from a multinational insurance company in Malaysia. At this stage, it is unclear which insurance company will be appointed as the insurer of the programme. One thing is for certain, this will have a negative political impact on Pakatan Harapan. One needs to understand the term 'critical illness'. The definition used by insurers is not the same as the public understanding of the terminology. What will happen is many claims among the B40 group would not be payable as the definition used by the insurer is not met. Allow me to illustrate. What if a B40 member had paralysis of one leg. Would he get paid for CI under 'paralysis/paraplegia' considering that the insurance CI definition does not pay for such a claim? How would the government react if the paraplegic B40 that cannot work and his claim was not paid and sought the help of opposition political parties and bring this matter to national media? This can easily be made as a racial issue the opposition. Another example that can be illustrated is that the benefit that is defined as "serious coronary artery disease." Under the insurance CI, one needs to have a three-vessel disease with a minimum blockage of 60 percent for each blockage. From the public perspective, if one has an 80 percent block and has symptoms, it is deemed serious enough and he would require the financial assistance to undergo the necessary procedure. The insurance company would not pay. How would the government handle the political backlash considering this is a B40 and do not meet the insurance definition of critical illness? I expect that there would be a lot of public backlash as a result of not being able to enjoy financial assistance. 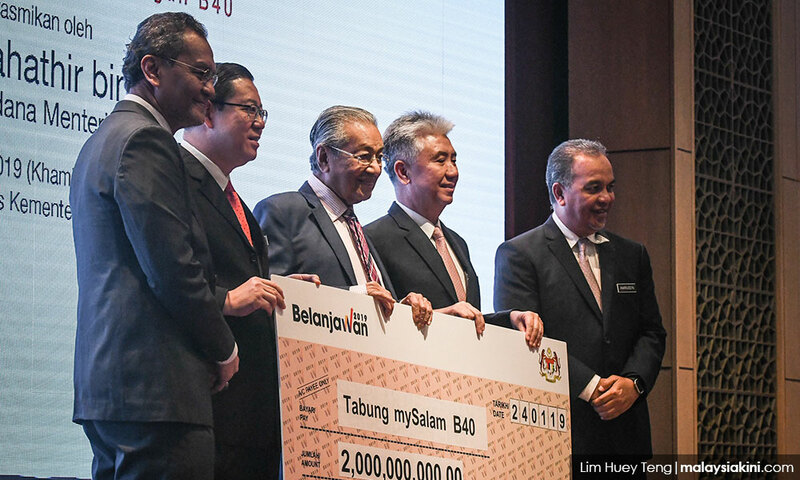 Political backlash aside, RM2 billion is a lot of money that can be used to support the B40 group under a National Health Insurance Programme (NHSP). The Health Ministry has studied the NHSP for the last 30 years, and last year, the government set up a company named Protect Health Sdn Bhd (PHSB). Unfortunately, this programme has been sidelined. The NHSP brings better value for money for the B40 and this will be the nucleus for the further development of the programme to cover the whole nation. In fact, part of the RM2billion can use to develop primary clinics under PHSB that should be open in semi-urban or rural areas with the aim of increasing penetration of service point. And such development can be done on private-public partnership (PPP) where PHSB can help finance the clinics set up for new doctors to take ownership of the operations. The ministry can direct its patients to these clinics. The benefit is tremendous. It will address unemployment for the medical professionals, improve doctor-patient access, especially where there is little private practice access and the government facilities are overcrowded. It will also be useful to ensure private healthcare cost remains affordable and stable. Currently, the private healthcare provider acts as a huge cartel when it comes to pricing and the anti-competition act has not been able to touch them. I am aware that political mileage is important. Harapan needs to show that it is doing something for the people, but it must also show that it is smart and prudent. It must also show that it has the vision to bring this nation to the next level. Having an NHSP is not only about political mileage or about healthcare. It has an impact on the economy as a catalyst and also could bring in the much needed FDI, as foreigners see the value of an integrated and structured healthcare system. This has been proven worldwide. One good example is the act of the Abu Dhabi Government in managing NHS via its company named Daman. At this juncture, I beg the government via the Health Ministry and Finance Ministry to revisit the financials and programmes planned for the B40 group. We need to get the maximum bang for a buck. Money is a limited commodity and we must make full use of it. Let the Health Ministry and PHSB manage the two programme and integrate it in such a way that we can get maximum value. The Health Ministryis the expert and has the necessary resources, infrastructures and experience. Perhaps the only thing needed a bit of private sector culture infusion?